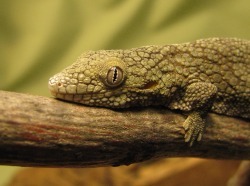 Another native of the island of New Caledonia, E. agricolae can be kept in much the same manner as members of the Rhacodactylus family such as crested geckos. 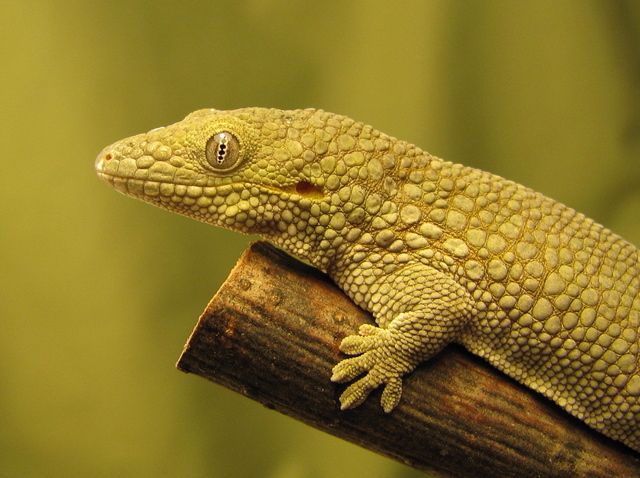 Of course smaller cages can be used, as these are a much smaller gecko than any of the Rhacodactylus. At first glance, these may appear to be a rather small, drab gecko, but it is upon closer inspection and observation that the unique nature of this gecko can be appreciated. The scalation and structure of this gecko give it a somewhat prehistoric look, and they are able to change colors from nearly solid black to a highly patterned minty green color. 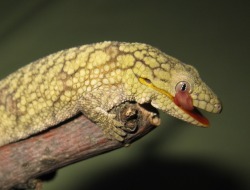 This is a relatively slow moving gecko which likes to hug tightly to a vine, branch, or even your finger... no sudden mad dashes for freedom or unexpected leaps into thin air from this gecko. Their movements are generally slow and deliberate. Their coloration allows them to blend into their environment perfectly. As they hug their bodies tightly to a vine or branch, they sometimes become difficult to find in their cages. 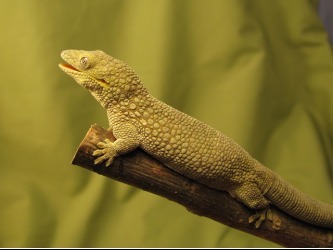 Overall, these are a really cool gecko that will grow on you if you give them a chance. I'm not surprised that many who keep this species rank them among their favorites. Eurydactylodes agricolae are native to New Caledonia, a chain of remote islands found quite some distance from the East coast of Australia. This is a "subtropical" climate with temperatures moderated by the surrounding ocean waters as well as the trade winds. There are not large variations in seasonal temperatures. New Caledonia sometimes refers to itself as "the land of eternal spring". The cool season is from April to August, with the hottest period being from September to March. The majority of the rainfall occurs between January and March. These geckos have generally been found in forested areas on the islands. They are arboreal, spending most of their time off the ground in the lower shrubbery of the forest. They are not usually found in the upper canopy of the forest. 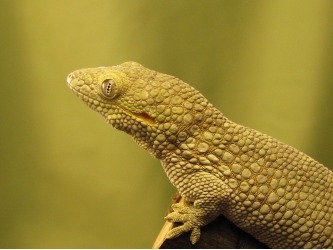 Coming from the same climate as crested geckos and other Rhacodactylus, these geckos can be kept in much the same way. They generally do well at normal room temperatures, so additional heating or lighting is not required. The ambient temperatures in my gecko room generally range from 70º F - 80º F, with a nighttime drop in temperatures of about 5º. Winter temperatures tend to run slightly cooler. My agricolae seem to do fine at these temperatures. Some keepers have reported that these geckos will choose to bask in a warm spot if one is provided. I have experimented with a small UTH and have found that the female especially, does seem to be attracted to this additional heat. Being an arboreal species, a small heat lamp would probably provide a more natural source of supplementary heat if one so chooses. I keep my breeder pair in a 12" x 12" x 18" front opening tank. Vertical space is more important for this species than floor space, as they like to climb, and spend relatively little time on the floor. I provide a variety of branches, vines, and twigs, as well as artificial foliage in the enclosure. I use a removable, washable shelf liner material for a substrate to encourage the female to lay eggs in a provided laying box which contains slightly moist peat moss. A naturalistic, planted tank would also work well and be very attractive, but locating eggs would become much more difficult. I mist these geckos once a day in the summer time and sometimes twice a day during the drier winter months. I also supply a water dish, but have never actually witnessed these geckos using it. I do often see them licking water droplets off the foliage or side of the tank after misting however. Like many of the native geckos of New Caledonia, these geckos eat a diet that includes both insects and plant materials. I feed Repashy crested gecko diet (CGD) 2 - 3 times a week as well as dusted insects a couple of times a week. Small lateralis roach nymphs and small crickets have worked well for me. I have not found these geckos to be aggressive insect feeders. They are "ambush" hunters, waiting for insects to come within range before grabbing them. I occasionally see a gecko grab an insect, but I am more likely to see them licking at their dish of CGD after the lights go out. I have noticed with the hatchlings however, that they really hit a growth spurt when they start to eat more insects in their diet. Males are quite a bit smaller than females and have a noticeable "bulge" which identifies them as male. I also find my males to be more highly patterned and my females more solid colored. 2008 was the first year I bred this species and I successfully hatched 2 clutches of eggs. The eggs have a leathery shell, much like a crested gecko egg, but are very tiny. I incubate the eggs exactly as I do for crested gecko eggs. They are placed on moist Superhatch and incubated at room temperature (70 - 80ºF). The hatchlings are very small and can be kept in small deli cups for the early part of their lives. Plastic "Gladware" type containers with ventilation holes work well. It is important to keep humidity levels relatively high for these tiny babies so that they don't become dehydrated. My hatchlings didn't seem to show much interest in insects for the first month or two of their lives, preferring to eat the CGD provided, but eventually begin feeding on insects as well.